“I’d like to bring you all a friend to us all, Mr. Bob Dylan”. With those words, George Harrison surprised the sold-out matinee crowd at Madison Square Garden during the Concert for Bangladesh. Actually two concerts (afternoon and evening), The Concert, held on 1 August 1971, was one of the first rock benefits of this size and scope, and laid the foundation for numerous charity rock shows in the decades that followed. 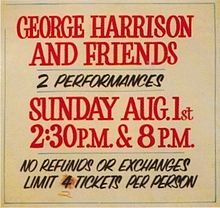 Organized by George Harrison, the shows featured fellow Beatle Ringo Starr (John Lennon pulled out a few days before the event, apparently when Yoko Ono was upset that she was not invited; Paul McCartney was never going to appear because he was sulking about the legal dramas from the break-up of the band), Eric Clapton (in severe heroin withdrawal), Billy Preston, Leon Russell and Ravi Shankar and Ali Akbar Khan. It raised $250,000 for Bangladeshi relief, administered by UNICEF, and continued to raise money through the film and soundtrack. The two shows were Dylan’s first significant stage show in two years, since the Isle of Wight, and he’d been finished touring for five years at this point. The story is that he almost failed to appear, showing up at the sound check the night before and panicking at playing for such a large crowd. In the film, you can see Dylan’s afternoon set (well, four of the five songs) beginning at 1:09, and just before he introduces him Harrison clearly goes to check to see if Dylan is actually come out on stage. 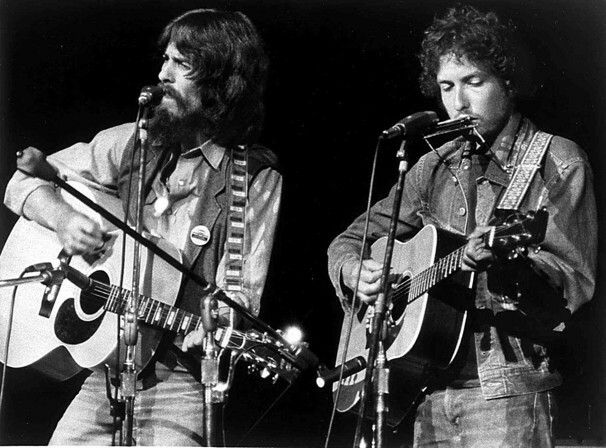 Dylan did five songs backed by Harrison, Starr (on tambourine), and Leon Russell: “A Hard Rain’s A-Gonna Fall”, “Blowin’ in the Wind”, “It Takes a Lot To Laugh, It Takes a Train to Cry”, “Love Minus Zero/No Limit”, and “Just Like a Woman”. “Love Minus Zero” didn’t make the film or the album, but of the others it’s probably “Just Like a Woman” that receives the best version. In the evening show “Mr Tambourine Man” replaced “Love Minus Zero”, but that also doesn’t show up on the recordings of the show. This is some of the earliest really high quality video recording of Dylan. Yes, he can be found in the Newport Festival footage of Murray Lerner, and in footage from his two British tours, but this is the kind of well shot, close to the action camera work that would become quite common only later. There is a bit of a sense of being on stage with Dylan here, and he definitely seems like a much different performer than he did five years earlier. The entirety of the Concert for Bangladesh film is online on Vimeo (I still haven’t bothered how to embed Vimeo clips, just click through), but here’s a YouTube clip of “Just Like a Woman”. The entire concert is really worth watching if you have an hour and a half. Clapton really isn’t that good, but it’s interesting to hear Harrison doing some of the late Beatles material live for the first time. Also, UNICEF was promoting the fortieth anniversary of the show two years ago, so if you do watch it on Vimeo rather than buying it, you might want to make a donation. Sadly, forty years later and the problems UNICEF deals with are no less acute.